Chester's Restaurant franchise business opportunity. Free Chester's Restaurant business franchise information. A favorite with customers, <?xml:namespace prefix = st1 ns = "urn:schemas-microsoft-com:office:smarttags" />Chester's has expanded to over 1,700 locations across the USA and around the world. Chester's restaurants serve Great Tasting Fresh Fried Chicken that's cooked to perfection, with a unique taste and style. Our secret is a family recipe and process that's been successful for over 40 years. 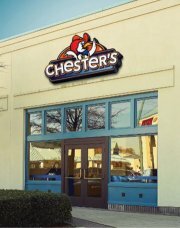 Chester's restaurants bring you delicious fried chicken, tempting tenders, sandwiches, wraps, salads, breakfast items and more. And that's not all we're known for! Our chicken is complimented by our signature Potato Wedges, Chester's Original Sauce and delicious biscuits and sides. To learn more about the Chester's Restaurant franchise opportunity, simply complete the form below.